The girls asked for Japanese food next week. I wanted to make a dessert to go with the rest of the Japanese dishes. 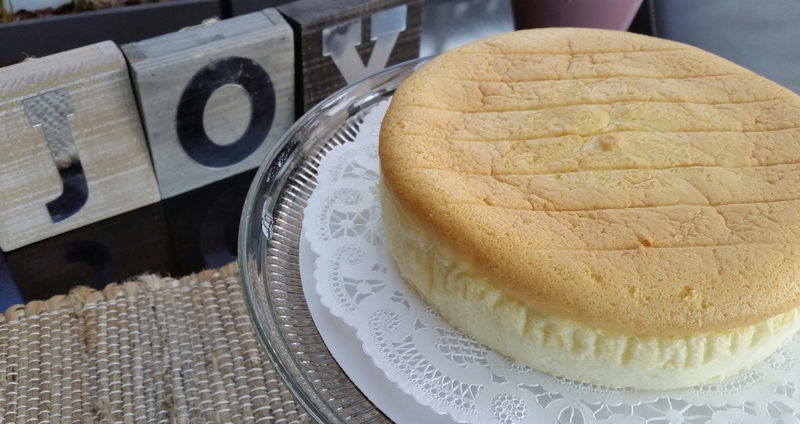 I came across several cheesecake recipes that claimed to be light, airy, and fluffy; looks like a good candidate for experiment this weekend. I tried one, not as light and fluffy as I had imagined, but it has a really good spongy texture. 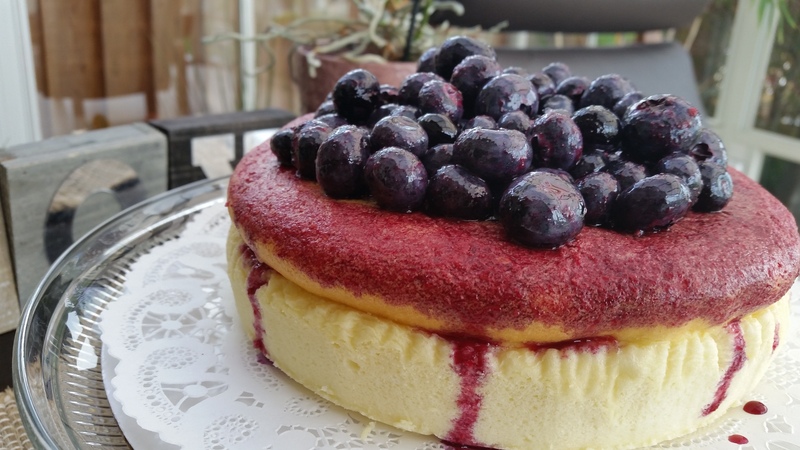 I decided to add some fresh fruit topping to dress it up, and out came this blueberry cheesecake. 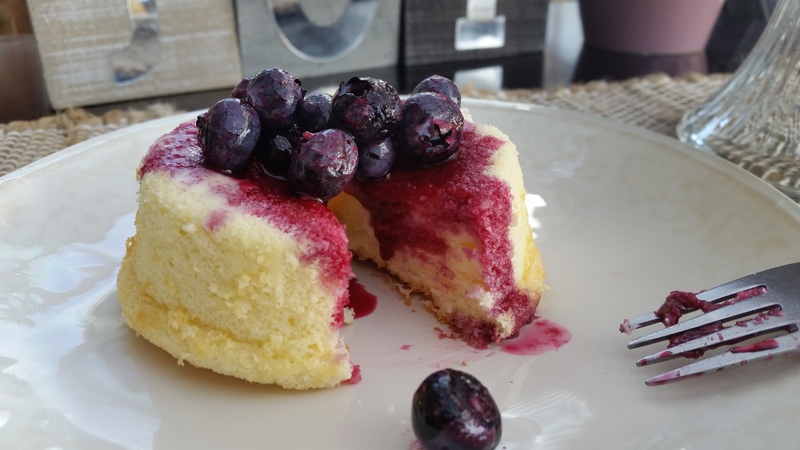 The spongy cake goes very well with the tart blueberry topping. Love it. Line bottom of an 8-inch round cake pan with parchment paper. Butter the sides of the cake pan and line it with strips of parchment paper about 3-inches high. If using spring-form pan, wrap a large piece of aluminum foil around the bottom. We’ll be baking the cake in a water bath. The aluminum foil is to prevent the water from seeping into the pan. Fill a small pot with about 2 inches of water. Bring to a boil and reduce heat to let the water simmer. Stir cream cheese with whipping cream and sugar in a medium-size glass bowl over the pot. Make sure the bottom of the glass bowl is not touching the boiling water. Stir until the cream cheese and sugar are melted and blended with the whipping cream. Remove the glass bowl and let content cool. When the cheese mixture is partly cooled, add the egg yolk, vanilla extract, and lemon zest. Whisk until incorporated. Sift cake flour and corn starch into the bowl. Use a whisk and stir until the mixture is blended. Run the mixture through a sieve 3 times, and set aside in a large mixing bowl. Divide sugar into 3 portions. Beat 1/3 of the sugar with half of the cream of tartar and egg whites in a standing mixer until the mixture is foamy. Continue to add another third of sugar and remaining cream of tartar for another minute. Add remaining sugar and continue beating until soft peak forms when the whisk is lifted. The egg white should look stiff and glossy. Fold a third of the beaten egg whites into the egg yolk mixture until blended. Continue to fold in the remaining egg whites until mixture is blended. Use the folding method instead of stirring or whisking the egg mixture. Pour mixture into the baking pan and place the tray. Fill the tray half-full with boiling water. Bake in the 315 degree oven until the top turns light golden brown. About 50 minutes. Reduce the oven temperature to 285 degree F and continue to bake for another 20 – 30 minutes until the top is golden brown and springs back when touched with the finger. Turn off the oven and crack the oven door open for another 15 while the cake starts to cool in the oven. The cake will shrink a little and pulls away from the side of the pan. Remove the tray from the oven. Carefully remove the parchment paper lining the edges of the pan. Invert the cake onto a wire rack and remove the parchment paper lining the bottom of the cake. Turn over and let cake cool on the rack. My cake seemed to be slightly fatter at the bottom, so trim the cake as desired. 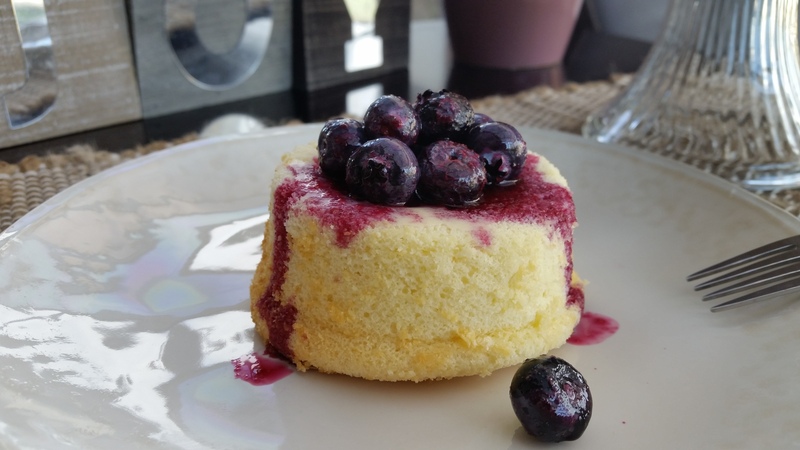 Dissolve sugar with 1 cup of blue berry topping over medium heat. Strain for the blueberry syrup. I saved the pulp to eat with the trimmings from the cake. 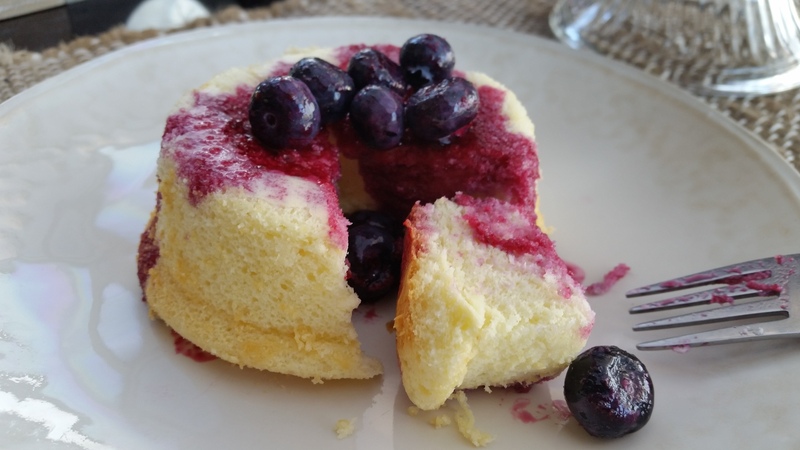 Toss the remaining two cups of blueberries and lemon juice with the blueberry syrup until evenly coated. Keep refrigerated until ready to serve. Brush blueberry syrup on top of the cheesecake. Pile the blueberries on top of the cake.